It was another solid meet for Team RUSH 27 as they competed in the FIRST in Michigan District at East Kentwood, March 28-30. The Clarkston High School Robotics team finished the match in the semifinals. Team RUSH 27 finished with a record of 9-7-1. They also finished earning a total of 47 points. They earned 17 quality points; 15 alliance points; 10 playoff points; and five award points. It puts the team at 18th out of 542 teams, with 120 points. The team won the Quality Award sponsored by Motorola Solutions Foundation. The award celebrates machine robustness in concept and fabrication. The winning team demonstrates these characteristics in many ways from planning through execution. Building the robot is only one part of their success and the judges recognize them as a quality example to others. 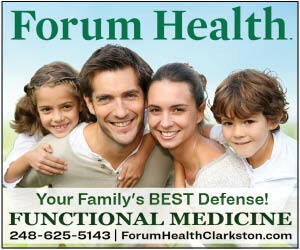 “Total Quality, this team understands. Attention to detail is a core demand. From robot through team members right down to the floor. This team exudes refinement and so much more. Congratulations, Team number 27, Team RUSH,” judges said. The award makes 105 total awards the team has earned over the years, which is more than any other team in FIRST. “We have also earned 13 quality awards, which is now one more than any other team in FIRST. 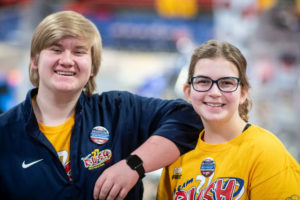 Team 254, CheesyPoofs out of California had 12 with us until this weekend,” Hughes said, adding statistics were collected by RUSH alumus Austin Schmitz. Grace Havel and Logan Rajala were nominated by the mentors for the Dean’s list. She added what topped the weekend was a visit from the Clarkston High School mascot – Wolfie. The Michigan State Championship is next week, April 10- 13, at Saginaw Valley State University. The competition schedule can be found at: http://firstinmichigan.us/FRC/state-championship.Follow the competition on Facebook and Twitter @TeamRUSH27 or check www.theBlueAlliance.com for match schedules, streaming and results.